All good things take time, naturally. In the case of melodic metal titans Category VI, who call the rocky shores of Newfoundland and Labrador home, the sizeable gap between their acclaimed debut Fireborn and their 2017 epic War is Hell proved to be fruitful. The end result of fine-tuning and polishing material through the rigours of studio sessions and live-audience testing is an album that firmly throttles the sound that made the band a contender and chokes it into submission with an unhinged ferocity that propels them to new heights. War is Hell is not a by-product of ears to the ground on metal trends and ‘fads’ of a genre that has morphed to the point of abnormality. Rather, it is an album that pays homage to the greats of yesteryear – the power metal giants and NWOBHM juggernauts that shaped the genre (Iron Maiden, Dio, Judas Priest, etc.) – while bravely forging ahead with a sound that doesn’t require cross-reference or explanation. With themes that criss-cross from war and death, inner and external struggles, loss and conquest, War is Hell sees the four piece at its finest. Vocalist Amanda Gosse brings a ferocity that is carried with a subtle restraint well beyond her years, an emotive confidence and ballsyness that carries the pace from opening slash to closing strum. Not lost in the fray, the album is propelled by the sublime talents of seasoned veteran instrumentalists Geoff Waye and Keith Jackman, who between them have decades of world-class artisanship under their belts and are true pioneers to Newfoundland’s thriving metal landscape. Strike of the Axe is an anthematic ear-worm of a kickoff for an album that has been chinched to the brim with sweat-inducing riffs, fist clenching hooks and melodies that demand repetition. It would be foolhardy to point out ‘choice cuts’ on an album that has been engineered without weak-points, but the title track, Out of Time, and Full Metal Jacket are destined to become cult classics (the mainstream would be damned wise to take note). 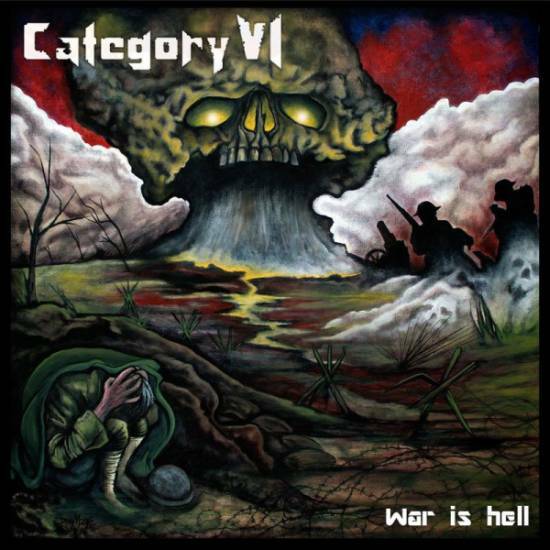 So if you like your metal aggressive yet smooth, soulful while never failing to thrash, and resonating without sacrificing in that certain visceral punch, War is Hell is a must – an album that will appeal to the diehard fans of a forgotten generation of thrashers and headbangers, while bringing sufficient juice and sizzle to lure wayward fringe fans of the millennium and beyond. War is Hell is available now on iTunes. Visit Category VI on Facebook and categoryvi.com for more information.